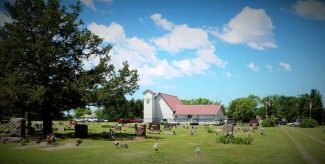 A beautiful day with blue skies welcomed well over 100 guests to the Purdum United Church of Christ Memorial Day Service on Sunday, May 29th. at Purdum, Nebr. 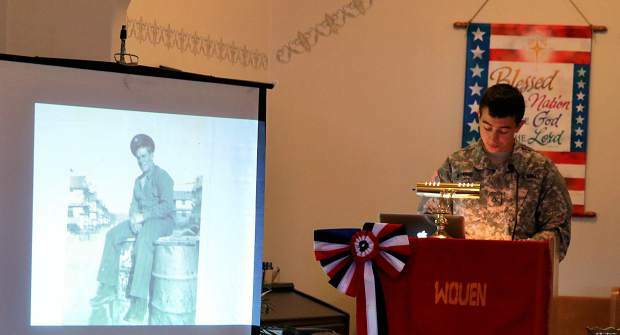 The event started with a carry in dinner followed by a program honoring five local servicemen who served in World War II and died fighting for their country. Pastor Diana K Jahn welcomed the crowd with an opening prayer followed by the Pledge of Allegiance. Kay Lynn Bestol acted as Mistress of Ceremonies. She told the story of PFC Raymond L Luther, Rifleman, US Army. Wayne & Joyce Bestol sang a song that was a favorite of PFC Luther. Pam Moody spoke about PVT Ole Strand, US Army. Jean Cox shared stories about 2LT James M Holmes, US Army Air Corp. Kay Lynn Bestol told about SGT Andrew McDonald, Infantry, US Army and Lois Gordon delivered known information about TM Max Rodgers, US Navy. Following the service the crowd proceeded to the Purdum Cemetery where the American Legion Post 79, Military Honor Guard of Ainsworth gave a 21 gun salute. The American Flag was then folded and taps were played. Children brought fresh flowers and put them on soldiers' graves. Every grave in the cemetery already had flowers placed upon them by the Cemetery Association. This is an annual event. Purdum, population 10 is located in the northwest corner of Blaine County, Nebraska along the North Loup River.